Does your child balk when it’s time to plan out a story or report? Does he tell you he’d rather just start writing? If so, read on! I’m sure you’ll relate to this question from the WriteShop mailbag. Q: When we brainstorm, my son wants to skip the planning part and jump right into the actual writing. It’s frustrating for him to just put some of his thoughts down and not expand on them right then and there. He has a hard time stopping his flow of ideas. Any tips? A: As much as he wishes he could do so, it’s often counterproductive for a child to pour out his whole story in free-spirit style. Without a plan, children have no sense of direction, and the story can quickly lose focus and disintegrate into a jumble of words. Instead, help them view brainstorming as a time of preparation—a part of the pre-writing process. Essays and reports that require summarizing and rephrasing of research so as not to plagiarize. Long reports and research papers that, by their nature, should be spread out over many days or weeks. Yes, explain to your kids why they need this skill. But also remember that brainstorming needs to be taught—even when they dig in their heels. Keep working with them to develop this skill of planning out story details. When they begin their actual story, they can flesh out their brainstorming into meatier sentences. As assignments grow in length, it will become even more necessary for your student to plan first and write later. There are many ways to brainstorm. When you’re not sure how to brainstorm with reluctant writers (or any child, for that matter), it’s good to experiment and try different ideas, such as the four listed here. Have your kids ever approached the blank page with fear and trembling? Often, it’s simply because they have no idea what to write about! This little activity will help them think of topics that interest them. Set a timer for 3 minutes and have each child make a list of every idea they can think of—with no erasing or crossing ideas out! If they’re timer-phobic, you can do this without timing the exercise. When finished, encourage them to look over their list and circle three ideas that would be the most fun or appealing to write about. List-making is an effective way to brainstorm with reluctant writers. Try this brainstorming method when they’re writing short reports about familiar topics. It’s also a great way to plan out a narrative about a personal experience. On a large sheet of paper (or on a whiteboard), write the main topic. Ask the kids to think of as many ideas as possible that relate to this topic. List all their ideas, even those that don’t really fit. Sometimes your child may want to do the writing. But often, a young writer’s thoughts gush out like a fire hose, and there’s just no containing them. If you can write as he talks, you can corral those random ideas on paper. Later, he can sort ideas into categories. Mindmaps are especially effective with spatial and visual learners. Give them a try when you brainstorm with reluctant writers. In the center of the whiteboard, draw a circle and write the topic inside. For the main points, draw several lines that radiate out, adding a circle to the end of each line. Ask who, what, when, where, and why questions to prompt the children. As they give ideas, write main points in the circles. They can write subpoints on additional lines that connect to each related main point. 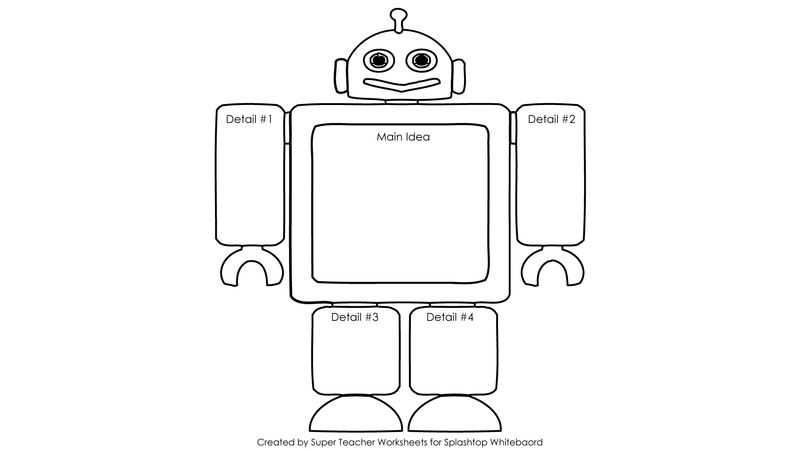 Graphic organizers such as the one on the left are worksheets that help kids sort ideas and plan story or report details. Traditional graphic organizers come in grids, charts, or idea clouds. But they can also take on more fanciful shapes, such as hamburgers or robots. Both elementary and middle/high school levels of WriteShop include an assortment of worksheets. The younger levels include both traditional and whimsical graphic organizers. Whatever methods you choose to brainstorm with reluctant writers, encourage your children to develop and practice lots of different techniques. Brainstorming is a lifelong skill! If you’re looking for a writing curriculum that helps you brainstorm with reluctant writers, a gem of a program is WriteShop Junior. It’s rich in graphic organizers, hands-on activities, and engaging writing lessons! Try Book D for 3rd and 4th graders, Book E for 4th and 5th graders, or Book F for 5th and 6th graders. Still not sure which level is best for your child? Check out this helpful guide to skills covered in each level.